I believe I own 61 of 67 or so published Magic: The Gathering novels. I got my first MTG novel–Whispering Woods–in the spring of 1995–very early in my having been introduced to the game. I got the next two novels as well as the first around that same time. I read several additional ones through the local library. In 1998 or so I discovered The Brothers’ War via the same library and loved the book. I rediscovered it the next year, in 1999, at a bookstore at a mall near the University, along with at least one later novel. Fall of 1999, all of 2000 and 2001, and I believe into 2002, I followed most of the novels as they came out. I dipped a toe back in for the Time Spiral books and only ever finished reading the first novel before losing track of the series again. I added a couple more books over the years, and then made a concerted effort earlier this year in 2018 to acquire books I was missing. With the help of online Wiki stuff, I assembled a checklist a few months ago. With a couple of new additions over the weekend, I believe I’m "only" missing 7 or so of the books; 1 of which I’m not even sure is actually a novel. And of those that are, Alara Unbound is apparently selling for over $250.00, and I’m not even sure I’m willing to pay $15-$19 (including shipping) on the "cheaper" books I’m yet missing. I have to truly wonder if people that put such outrageous prices on "out of print" mass-market paperbacks actually ever get their asking price! And if they’re not actively actually trying to sell the books, I wish they wouldn’t list them. But that gets into other stuff I don’t feel like laying into with this post. The following list has served me well, and I present it here simply for informational purposes. I’m confident of the bulk of it, but would counsel doing your own research before considering it complete, authoritative, or remotely official! 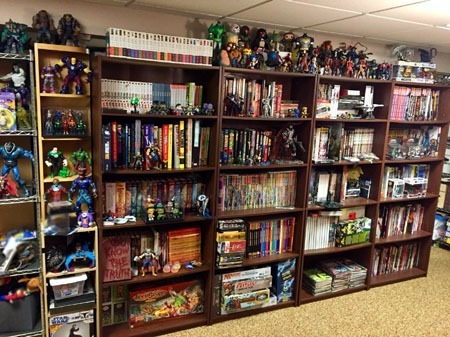 A Peek at the "Comic Cave"
I’ve mentioned new/additional shelving and rearranging for months now. I still haven’t gotten things 100% the way I want them, but with touching things up here, rearranging there, etc. I’ve had the overall space essentially set up. 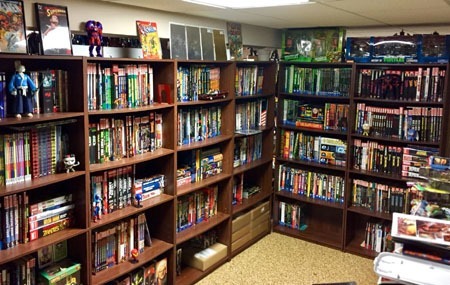 And falling behind on writing reviews–Ultraverse Revisited and otherwise–today I decided to show off the bulk of my "comic cave" space. However, it’ll likely be awhile yet before I get into a detailed "tour" or shelf by shelf show-off, etc. And even these photos show some of the rough edges and unfinished messiness…though do not show the huge mess that is my longboxes, shortboxes, "desk" and table. Above: an "outer" view of the main "library" (I’ll show the "inner" view further down). The bulk of the action figures on the front, with a corner piece for some of the Build-A-Figures and giant Heroclix; and presently some general storage/mess. Here’s a better look at the bookcases from the above photo. 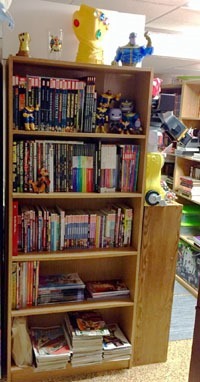 The far right is graphic novels, and then other things on the shelves to the left beyond "just" graphic novels. 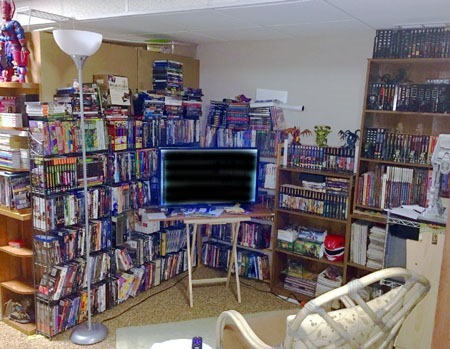 Opposite of these is my "media and games" space, as well as my Magic: The Gathering books, and Aliens and Predator books, as well as movies and tv…plus some storage. 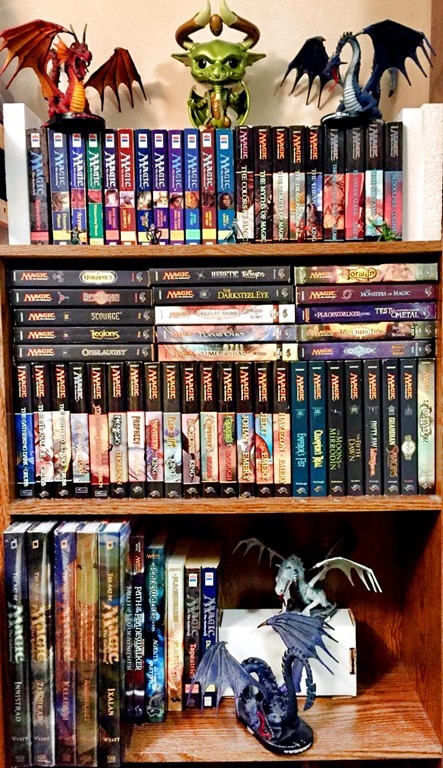 …And here’s a view from the other side–the small bookcase is my Dragonlance paperbacks. 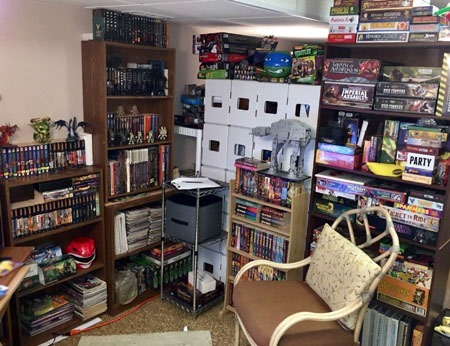 The bookcase behind the chair has boardgames, card games, and even trading card binders. This bookcase is seen looking out from the "inner" view of the main ‘library’ and includes the Thanos Shelf I’ve shown off a couple times. 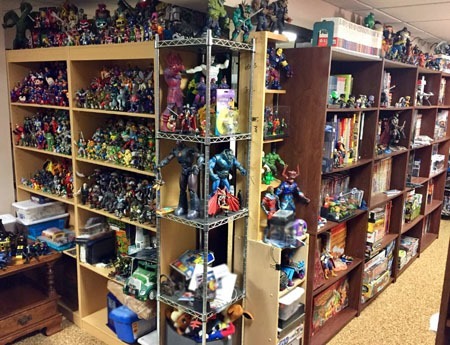 And here’s an "inner" view of the first photo of this post, with primarily my DC and Marvel stuff, plus some storage with some of the bottom shelves. The cropping here is to avoid much of the mess I’m not ready to show. As said…I’ll probably show off a more detailed look sometime later–including the staircase down to the basement, a few things I didn’t specifically show here, and a better sense of the space as a whole. 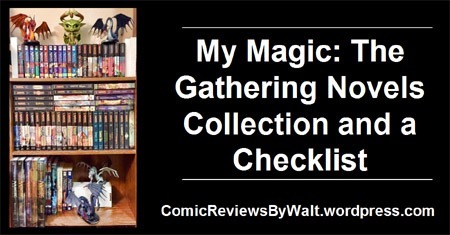 For now, this is a peek at the heart of my collection and where/how most of it is stored at present…at least, outside of the single-issues collection…the longboxes and shortboxes are quite the mess at the moment, as well as my "workspace" and "desk" and such. April 26, 4/26–chosen for the planet designation LV-426 where the Alien was found and then the larger outbreak in Aliens–marks the day to observe the franchise. For my part…sharing my latest shelf configurations! 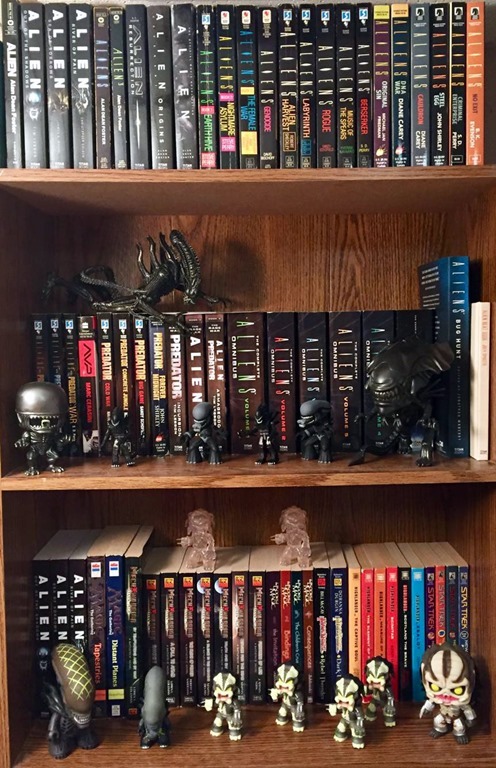 I believe I have all of the Aliens paperback novels at this point. Including the Predator stuff, I’m still missing a Predator Omnibus from Titan; but I’m not in a huge rush to get that. There’s also a Predator counterpart to the Aliens: Bug Hunt volume; but again, not in a rush to get that. Along with the books themselves on the shelves, I’ve got the various Pops and Mystery Minis and Minimates and whatnot. Seems the most appropriate place for the figures to be! 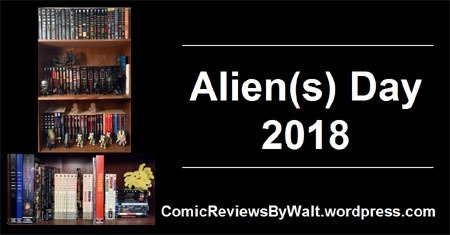 Along with the various paperback novels, of course I have a number of comics volumes for Aliens, Predator, and Aliens vs. Predator. And rather than have them lost in with everything else, I opted to move my Blu-rays to this shelf (with the added benefit that they help keep everything standing up for the moment). I was counting on a matching volume to the Fire and Stone stuff with Life and Death, but never having seen anything about a hardcover and recently-ish seeing a paperback…I’m quite disappointed at the lack of proper "library edition" volume. 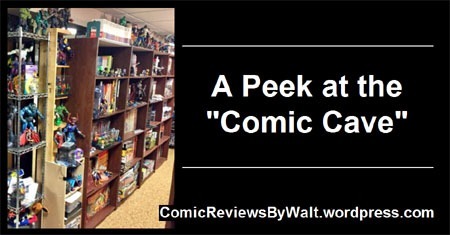 With my recent reconfiguring of the entire "comics space" I wasn’t able to find a good way to have the novels together with the graphic novels…so they are actually completely different bookcases in different parts of the overall space. I imagine I’ll get into more on that whenever I get to actually re-photographing the entire space and shelves and working up a huge post showing it all off! As of mid-October 2017, this shelf has had some newer additions! There’s a Thanos figure from the newer Guardians of the Galaxy line (based on the animated series, I believe). I picked up the Adam Warlock Toon Tumbler over Labor Day weekend. And the most recent addition…the "desktop monument" of the Infinity Gauntlet itself, snagged last week spur of the moment on New Comics Day. I saw it, disregarded it, asked to look closer, and decided to just go ahead and buy it–knowing darned well I’d want it eventually and rather than spend even MORE money trying to hunt it down later, just get it and be done! Then, of course, there’s the Adam Warlock Marvel Overpower figure (yeah, they did a small line of figures using the branding of the card game!). The Funko oversized Pop vinyl bobblehead (one of the extremely-very-few Marvel ones I’ve bought DUE TO their being bobbles). The Thanos with the bright orange gloves and boots is from the ’90s Silver Surfer animated series’ toy line. And the giant Infinity Gauntlet is one of those large coin banks. I do have a Thanos "bust bank" not pictured, that would almost have to replace the books to work well on this shelf. I’ve been looking forward to the TMNT Artisan Edition for a number of months now! I was looking forward to it, and thought I might’ve missed it, back in March or April, and then thought it was due out around the end of April, and it kept not being on the week’s shipping list, and on and on til now. I’d eventually ended up pre-ordering it via Amazon, just to make certain I wouldn’t miss out on it, and was quite surprised recently when I got a notification that my order had been "upgraded" to get the book day-of-release, August 8th. Of course, given that it seems like most of the time anymore, Amazon gets "access" to stuff a week or two AFTER comic shops, and this is from IDW, I just "assumed" then that I’d be able to get this from a shop mid-late July, but it wasn’t. Then this week, I find out it WILL BE in shops…this week. But my copy, from Amazon, has already arrived. This is a huge book, and quite the attractive volume! 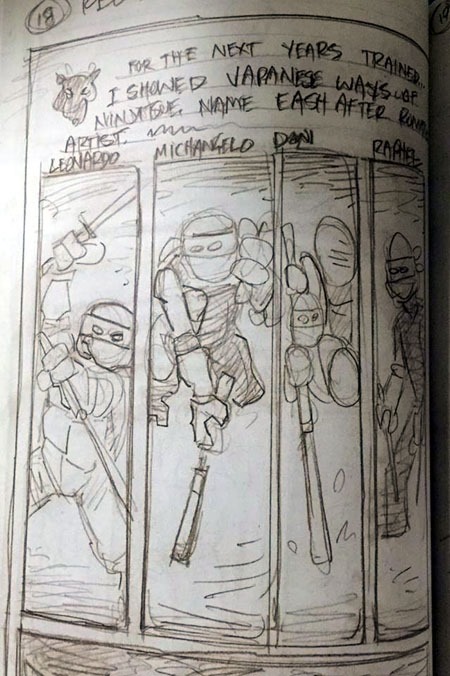 It contains original layouts and notes and such on the original first TMNT comic, as well as the finished version, and some extra art and such (a couple original ads for the first issue and sketches and such). Not a huge quantity of material, but enough to pad this out and make it highly worthwhile, at least to me. 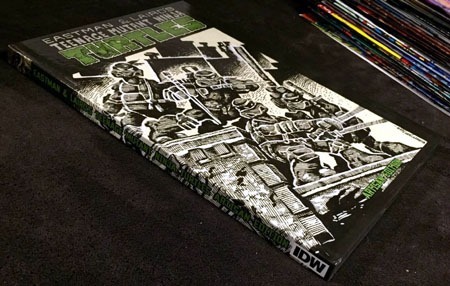 As said, this is a huge book…it’s even larger than the TMNT Ultimate Collection volumes IDW put out a few years ago, and this book will not fit on the shelf with these–it’s too tall! 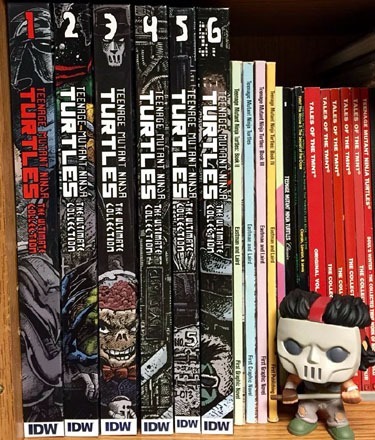 So it’ll perhaps get some special display spot, be relegated to laying on its side on top of the books on the shelf, or perhaps I’ll move all the TMNT stuff to a shelf with a bit more space when I next reconfigure my ‘library’. 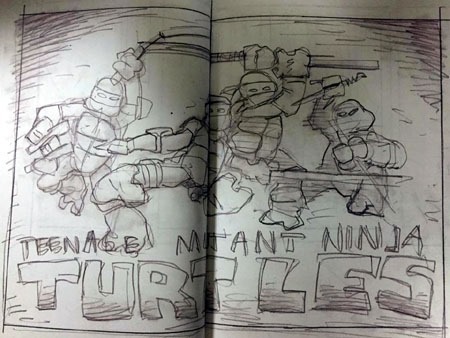 …and yet how much more detailed the finished version is! 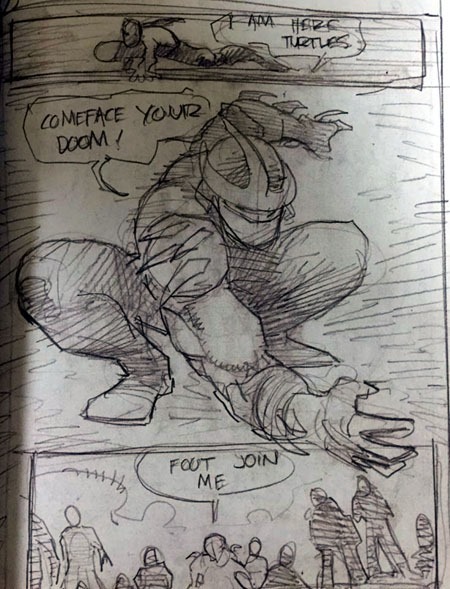 (pardon the compressed/curve in the photo, the pages didn’t want to stay quite as open). And flipped for the final version in more detail. 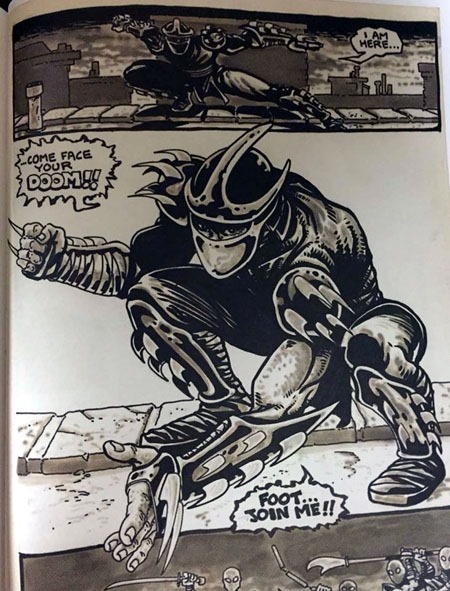 I still really dig that this original issue was only ever intended as a one-shot thing, and that Shredder–the real, actual, not-a-clone/etc Shredder–had his first and last appearance in present-day here. At the same time, I have come to really dig the IDW Shredder across a 50-issue run and appreciate that sort of longevity to that version of the character. But that’s a post for another time. Here’s the book next to the latest issue of IDW‘s run. 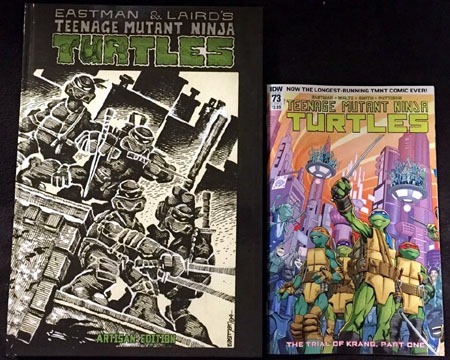 Fitting…a version of the original issue, with what is now the highest-numbered-ever TMNT issue. 1984 – 2017 and still going! Along with getting to see a dear friend for the first time in far, far too long…I got to visit three Half-Price Books locations that are out of my usual range. Perhaps because of not being usual haunts, and the last time I’d been to any of the three had to have been at least two years or so ago, I found some stuff at each that proved enough of an interest to actually purchase. 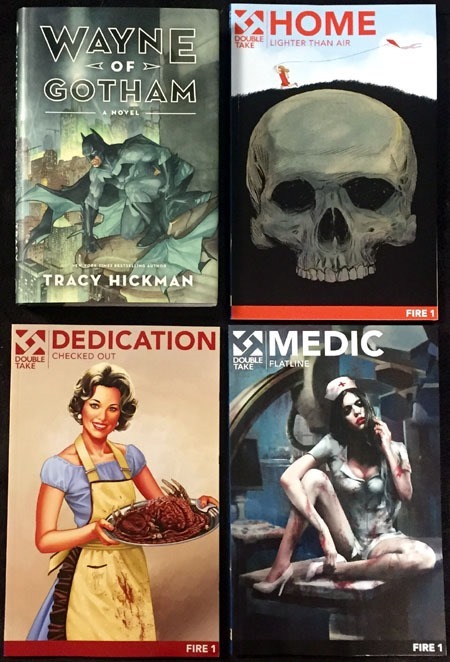 At the first one, I found a very good-condition copy of Wayne of Gotham by Tracy Hickman. I’ve listened to the Graphic Audio production of this book and quite enjoyed it. Having the hardback (not just some paperback) is fantastic! 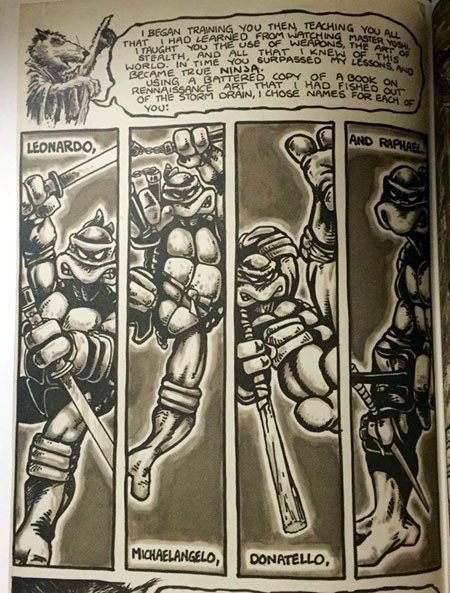 Then, I found a set of all ten of the Double Take volumes. I already had seven of the ten…but I’ll be darned if I could’ve remembered which. But fortunately…I periodically try to get photos of my shelves for just such occasions, and was able to –in that way–"look at my shelves" to see which ones were there, and pick out the three to complete my set! At the next location, I found the Superman: New Krypton vol. 3 that completes my set of that series of paperbacks. I still need to track down Last Stand of New Krypton vol. 1 in paperback and then I’ll be all set on that story. 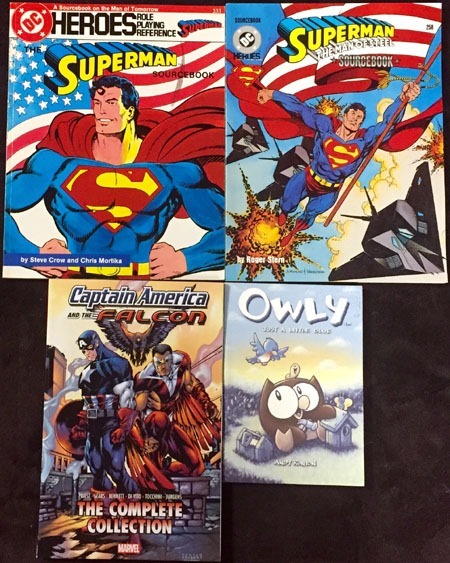 At the third/final HPB, I happened across these two Superman sourcebooks. The covers alone make them of interest…as well as their subject matter! 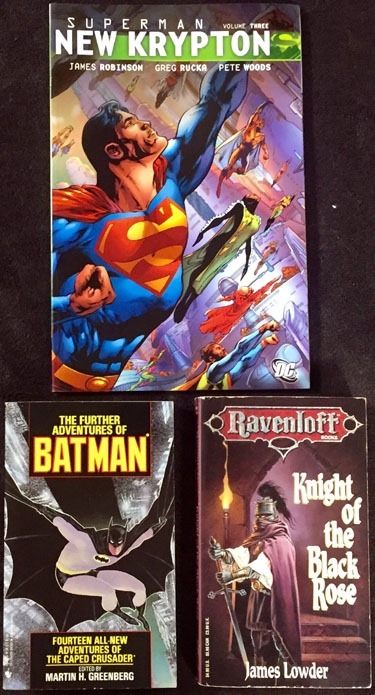 There were at least half a dozen other DC supplements in addition to these–after the earlier purchases and other stuff going on, there was no way I could justify getting all of them…especially as they’re for a game I doubt I’ll ever actually play. The two Superman ones are justified for me because they’re Superman! There were several Owly volumes. I’ve always meant to give the book a shot, but never got around to it. I grabbed the cutest-looking one and we’ll see. I can’t imagine not liking it, though! And finding the Captain America and the Falcon volume makes me highly glad I held off on buying it before at a higher cost. In its own way, this goes with the Black Panther volumes I already have–collecting the Priest run. Since this series, too, was Priest, it’s been on my radar since getting the last Black Panther volume. 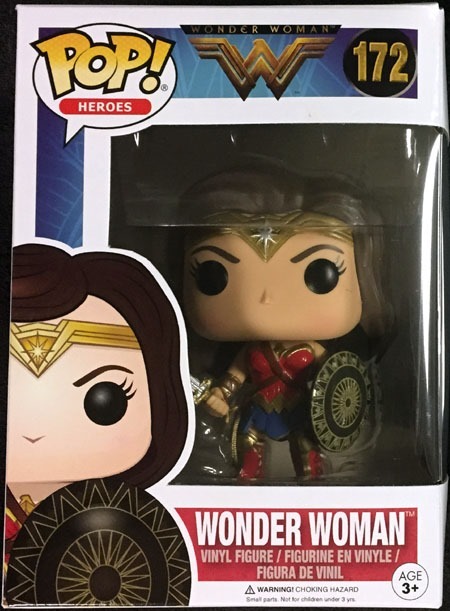 Then at a Walmart, I came across a display box full of the various Wonder Woman movie Pop figures. For this first time (offhand) since I started seeing the line in stores, I actually found the title character herself! There was a Walmart-exclusive version with a different body pose and without her sword. I liked the look of this "regular" non-exclusive version better, having the sword and shield. I haven’t cared for many of the "movie versions" of characters…but Wonder Woman is a definite exception for me! I’m also not a huge fan of mask-less human characters for the Pop range of figures–the faces being accentuated and being so plain and boring tends to be an issue for me. But again…for this one, I made an exception. I actually stopped in at a fourth HPB location on Sunday–this one the closest to home and my most "usual" one…and found nothing of interest enough to buy. A few things to look at more closely than just walking past…but nothing that jumped out as wanting to buy right now or that I’d miss if I didn’t buy. While I highly disagree with the "base" $2 price for single-issue comics in HPB stores…the "usual" one is one of the stores I tend to get the most frustrated with in their mixing high-price out-of-print volumes in with the main collection. At the three others I visited over the weekend, I did not have any cases at all of something catching my eye but then being sticker-shocked. Everything was at least the store’s premise of half-price if not more and so made me a rather happy camper (so to speak). 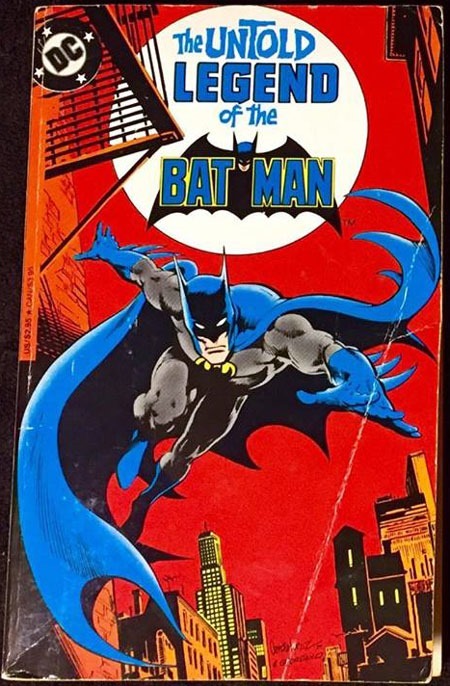 I ordered The Untold Legend of the Batman vintage mmpb via Amazon last week. What arrived is considerably more beaten and battered than the condition described in the 3rd-party listing…for which I solidly blame Amazon itself and its disgustingly-shoddy packaging! (and which was FOLDED to jam into a mailbox rather than being BOXED so that it could actually be protected in shipping). 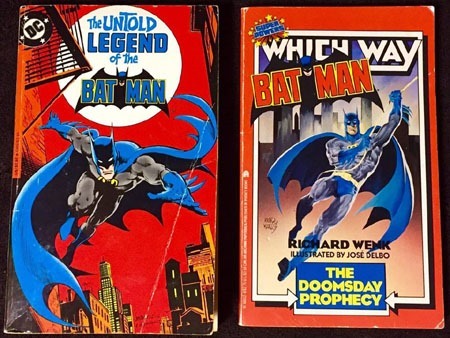 These were two key books for me as a kid in informing my knowledge of Batman and illustrating some of the villains and whatnot (as well as being BOOKS and not JUST single-issue comics!). Meanwhile, Half-Price Books was doing a 20% off sale, and I made it to a location I hadn’t been to in a couple months, and after being horrified at a $250 pricetag on an X-Men hardcover, and outrageous extreme-prices on a couple other hardcovers, I opted to "complete" my Batman Eternal paperbacks collection. I already had vol. 1, and snagged vols. 2-3. 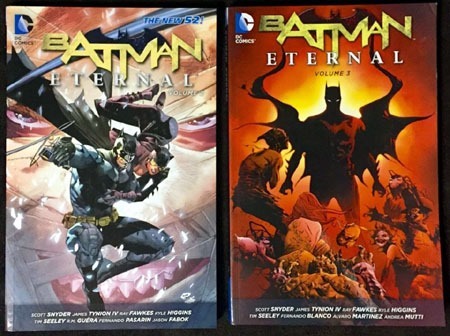 Now I’m just missing Batman and Robin Eternal vol. 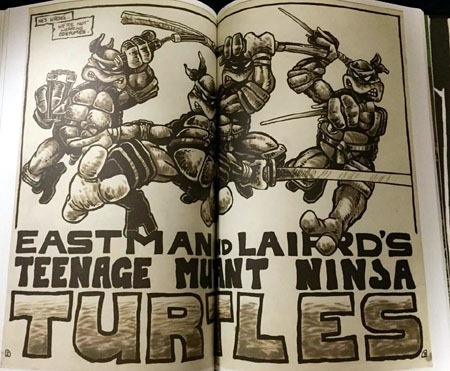 2 from the 5-volume run of the two series! 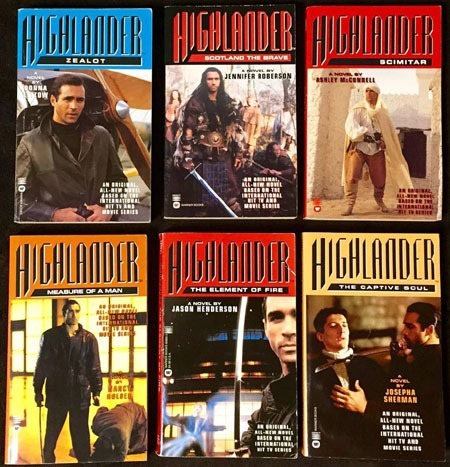 I also found six vintage Highlander mmpb novels and figured that–for the price of 3-4 Marvel comics, I’d pull the trigger on them. I know I’d owned Scimitar at some point and possibly one of the others (can’t remember which) but never in the past had this many of the books!